Armageddon or Just Carnage ? A lot of people involved in the US music industry one way or another would come and see me in the shop. Just under 10% of twitter followers are from the States as are 15%+ of people who read the blog. Certainly with vinyl the US was a year or two ahead of the UK at least in the beginning. They were complaining about $25 albums you could buy for a dollar long before the phenomenon hit the UK and going by the imminent reissuing of 13 Genesis albums on vinyl it hasn’t stopped yet. Anyway earlier this year while the shop was still open I had one such person in from the US who said he read the blog and was interested to hear how long I thought the rise in vinyl sales would last. I answered that some blindly seemed to think it would go on forever while others privately would say they would be glad if they got one more good Christmas out of it. What I asked was his take on things ? Some are predicting Armageddon he said but most just think there will be carnage. The problem to anybody prepared to admit it was obvious. A lot of the “vinyl revival” was media led. No doubt the public had embraced it often on a wave of nostalgia but it couldn’t be denied half the vinyl at least wasn’t even being played either going to collectors who put it in a cupboard or younger folk who put it on display. Even more importantly the increased vinyl sales were in no way making up for lost CD sales and that applied to new and second hand. More high profile stores with overheads that were only ever going to rise and revenue that could only fall were preparing for the worst. From east to west you will see stores deciding to close rather than wait for the inevitable he said and you will be surprised. Those selling new product were most vulnerable but even for large used stores there was a problem. Once the downturn started and people started selling their vinyl all these reissues would have little value and the number of people who would consider buying vinyl, already not a huge figure, would drop considerably. Small used stores with relatively low overheads and maybe dabbling in new stuff would have most chance of survival. This is of course exactly the kind of shop that has sprung up in the UK. Not long after his visit I had an Australian record shop owner in saying much the same. With 60 stores in both Melbourne and Sydney the situation was already untenable. Soon Origami Vinyl in LA announced they were closing citing the difficulties of selling new releases despite being next to a great venue and having had recent poor Record Store Days. 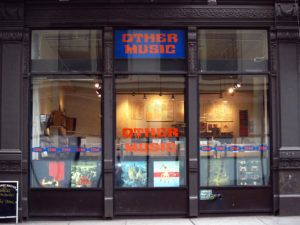 Others followed but when Other Music in New york announced they were closing all that had been said came back to me. They had seen off so many others including a large Tower Records opposite that you kind of felt they were immune. Again they blamed takings that had halved and a change in how people looked to discover new music. 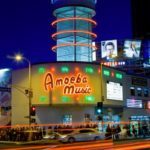 However never did I expect to hear the news that Amoeba would leave its iconic Hollywood store. Yes it won’t be for a while but the sense of preparing for the end is still there. The UK is a little different to the US and London and Brighton live in a bubble with access to all the record companies and most of the bands and labels. There are a few fantastic shops left in the bigger cities and the rest are very much starting to fit that category of second hand shops who need little income to survive and dabble in new vinyl. Shops like Origami did mention the “big box” stores all jumping on the vinyl bandwagon but they have no HMV or an equivalent in the States. As they have shown in Ireland Hilco will pull the plug on HMV/FOPP when it suits them which will be an added factor in who survives. In the end it may not be competition from other retailers on the high street or online that closes down independents in the UK. It will probably be caused by the very bands and labels they are trying to support. This Armageddon may not be a battle between good and evil but if shops are to survive then they have to be given more than tokenist indie exclusives and the once a year bounty of Record Store Day.